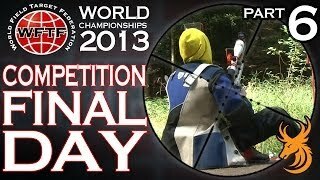 This website covers all the activities of the World Field Target Federation and it's shooting competitions. Field Target (FT) first started on the 7th September 1980, the first event being held on land behind a pub called the Red Lion in Magham Down in Sussex. Over 100 people attended this inaugural event, armed with air rifles varying from a Webley Vulcan in .22 calibre to an FWB 300 match rifle. It was originally started as an informal sport for anyone with an air rifle. The original targets were not the knockdown type we know now, but simple metal silhouettes of the common quarry species, to which orange stickers were affixed as hit zones. The new sport quickly gained popularity and spread across the UK. By the mid 1980's the sport had grown massively in popularity, with the familiar knock down style targets being introduced. The introduction of the Weihrauch HW77 was a pivotal point in the sport, as this rifle quickly established itself as the rifle of choice, either out of the box or in a custom form from specialist tuners such as Venom Arms and Airmasters. At some point in the mid 1980's, FT shooting was adopted by the USA, initially hosted stateside by only a handful of small clubs across the country. As more shooters joined the legions of devoted weekend "hunters", there appeared a need for a national organization to oversee the growth of the sport. Thus, the American Airgun Field Target Association (AAFTA) was born in 1987 to manage the sport. The US rules differ slightly from the UK version. By 1987 the sport had reached comparatively massive proportions in the UK, with attendances in excess of 300 at the national shoots. 1987/88 saw the first serious use of pre-charged pneumatic (PCP) rifles and high magnification scopes in FT, which would ultimately have a profound effect on the sport. The first international FT events started taking place somewhere in the mid 1980's, with UK shooters being invited to attend events in the US. Shooters such as Richard North, Tom Walton, Terry Doe and others travelled to California for various events around 1987/8. The first formal world championships came about at the end of the 80's into the early 1990's, with the venue alternating between the UK and the US - these two being the only major players at this time. Over the 1990's other countries started to appear on the scene. Norway was one of the first with Germany following at a later date. 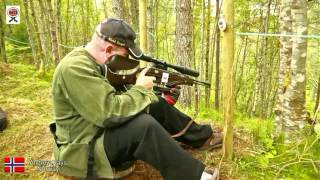 By the end of 2011 the WFTF (World Field Target Federation) already consisted of 30 member countries. The WFTC 2018 will be hosted by Poland between the 21st and 25th of August. The course will be located in a disused quarry near to Niegowonice, with accommodation located at the Villa Verde Hotel in the Kraków-Częstochowa Jura area. Practice ranges will be available at both the competition area and the Hotel Villa Verde. The courses will be integrated, and there will be two sessions per day, with the maximum entry number limited to 375 competitors. From 2016 onwards the World Field Target Federation will use an official calibrated target checking device to test that targets are functioning correctly during the Championships. The device is designed in such a way that it can be easily 3D printed, and the designs have been made public domain so that any country can produce these for use in their own competitions. Although 3D printing is still relatively new, the technology is set to grow rapidly over the next few years to the point where every school will have their own printer and an estimated 40% of homes will have one by 2020. The unique combination of 12fpe (16 Joule) rifles and the rules for target distances and killzone sizes mean that a challenging FT course can be set out under any conditions anywhere in the world. This guide to setting out a course to WFTF not only outlines the rules for target placement, but has helpful hints and tips on how to tailor the course for the different weather conditions around the world. Some of the most experienced Field Target course builders in the world have had an input into this guide and by following the recommendations you will be able to set a challenging course in no time. The sport of WFTF Field Target shooting is gaining huge support from all over the globe. If you can help with content for this site, it would be greatly appreciated. Please use the Contact Us form to get in touch with any suggestions or let us know if you'd like to help with the review process of new guides.